Don’t be afraid of failing. Use it as a learning experience. Shaun Randolph came to Los Angeles with AmeriCorp with the mindset that he would work with nonprofits to help them with grant writing and fundraising to do projects that would help change under served communities. What he found was that the model wasn’t sustainable. 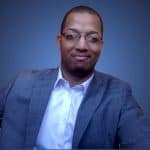 He worked for four years starting businesses with ever evolving ideas to come up with a way to use the principles he was learning in investment banking and private equity to help fund development in communities of color. Listen to his story of how he started several companies and ultimately partnered with a long established private equity firm where he is currently raising $100 million for investments in communities of color. Loved hearing Shaun’s story. He is persevering in spite of the challenges he has faced. Much success in future endeavors, and thank you T.Q. for creating this forum so we can hear of these individuals who are trying to make a positive difference in our communities. I really enjoyed hearing about Shaun’s journey and success (this is Cherie Williams :)). I am listening to the podcast at work. You all did a great job of helping us understand how the complex investment world is relevant to communities of color. Shaun is absolutely right about how the nonprofit sector needs to transform their capital building process. There are tax implications to public-private partnerships but the overall result is worth it. You all did a great job! Thanks @octobergirlie. Shaun’s a super sharp guy and I learned a lot from him too!